Proletarians of all countries, unite!" is one of the key slogans of the Communist Manifesto. Some seem to have forgotten this exemplary principle and transformed it into: "Proletarians of all countries, unite with your bourgeoisie! When the bourgeoisie makes an appeal to swell the ranks of nationalism, there will never be a shortage of those who, with "progressive" talk, will want to drag the workers in and disguise themselves as champions of socialism. They really are only belated imitators of Fichte and Wagner, worthy heirs of those German Social-Democrats who pushed the German proletariat into the slaughter of the First World War. The nationalist philistines can only be confronted with proletarian internationalism: the worldwide union of all workers across borders and against all bourgeoisies. The nationalists' paradise is the clash between workers and the rise of new frontiers. It is easy to see how nationalism, painted red, has had a great influence on the Spanish left for too long. From the Spanish patriotism of the PCE of the 30s, to the abertzal** the CUP and the like from the late sixties to the present. Each Spanish territory seems to have generated its nationalist hooligans, with red star flags, various historical laments and feudal nostalgia. These groups, saviours of homelands previously happily forgotten, have tried to mix a curious concoction between an appearance of Marxist lexicon and the most picturesque petty-bourgeois and clerical ideologies. For example, Sabino Arana or Blas Infante. One, the post-Carlist Basques, known for his racist outbursts and his ultramontane clericalism, the other, the Andalusian lawyer, known for petty-bourgeois nationalism defending a new fantasy homeland and for its affiliation with Islam. Picturesque both, without a doubt. But in the sixties, amongst the excrescences of parish groups and seminaries, the "communists" of national liberation appear. Following in the footsteps of the counterrevolution, they gave a few strokes of red paint to nationalism and presented the provincial versions of the "national union" as the most revolutionary thing a communist could do. What were their revolutionary programmes? Manifestos against the oppressive Spanish state, removal of Spanish flags and paying lip service to a "socialism" that was not even such, rather it was state capitalism. It's about time we call them for what they really are: nationalists who do not even go as far as social patriots, because social patriot means socialist in words and nationalist in deeds. These are nationalists who speak as nationalists and call the result socialism by putting a red patch on the current flag ... or a purple stripe, which is the same. These nationalists act as true parasites, in a continuous search to take advantage of the struggles of the workers, do not miss the opportunity to poison us with nationalist propaganda. It is clear that they almost always fail in their intention to confuse the workers, so they must nurture their ranks of young petty bourgeois, excited by the national struggle that promises them positions of government in a future independent state. However much they see themselves as communists, they are nothing more than the romantic and idealistic vanguard ... of the same bourgeois state we already know. At the height of nonsense, there is no shortage of those who try to respond to these patriots with Spanish patriotism dressed in Marxist quotations ... against nationalism. Cultural attachments can be felt, of course, but it is despicable to use cultural tastes as a symbol of political struggle in defense of homelands and nations. And it is even more so if they call themselves Communists. The communist struggle is indivisibly linked to internationalism, which is nothing but proletarian anti-nationalism, because our struggle is not the struggle of the proletariat of one country or another, of one sector or another, but the struggle of the world proletariat. The time for bourgeois nationalist revolutions has already gone. All over the world, political nations have arisen, at different points in time, and the struggle of any particular bourgeoisie to take control of a state no longer has any progressive meaning. The next scenario is that of the alternative between the world revolution or a new imperialist world war. Therefore, all those who remain in the defence of a nationalist cause, whatever it may be, are true reactionaries in the face of historical evolution. The call for the defence of the right to self-determination - already widely dismantled by Rosa Luxemburg - serves as the new flag of opportunists, social patriots and outright patriots of which we have so many examples. All of them, in the faithful service of the petty bourgeoisie, loser in the suddenly revealed crisis, faced with monopolies and capitalist centralism. Although televised trash should be kept at a distance, sometimes pearls are found in the mud. In a debate that took place late at night between two economists, a Spanish Socialist and a separatist Social Democrat, the real reasons that feed the conflict were on show; the interests of the Catalan petty bourgeoisie. The economist made the criticism that, since the disappearance of the Franco regime, the productive and economic importance of Catalonia had been decreasing to the detriment of Madrid. The Catalan petty bourgeoisie has been losing business opportunities, while the Spanish bourgeoisie (which includes the Catalan bourgeoisie), has been concentrated in the capital of the country. For a few minutes, amongst the murmur and the shouting of the TV show, the true anger of his class was evident. And the fact is that under Franco some lived better. Is it to these petty bourgeois in action that certain "communists" pay homage as vassals? If they want to be the mamporreros of a reactionary petty bourgeoisie, it is to be expected that they do not find the support of the working class, nor of the Marxists who refuse to collaborate. The response to nationalism and opportunism is internationalist action, uniting with workers around the world in the struggle for better living conditions. It is time to openly demonstrate against particularism and the lovers of native lands, who would gladly throw us into a fight against their neighbours for the defence of their masters' interests. Whilst capitalism continues to exist, in the event that one nation (call it A) gets invaded by another nation (B), if then because the armed forces of 'B' are likely to be mostly proletarian, do you say that workers in 'A' should just make no objection to being overrun, or that they should resist in the form of a liberation struggle ? The question remains, whether or not bourgeoisies are dominant in both. Any argument that workers in 'A' should fraternise with invaders from 'B' seems most unlikely to be accepted. The spasmodic histories of troops fraternisimg briefly at 'the front' are not a satisfactory answer to this question. In case war should break out anyway, it is their duty to intervene in favour of its speedy termination and with all their powers to utilize the economic and political crisis created by the war to rouse the masses and thereby to hasten the downfall of capitalist class rule. Of course we cannot simply echo the position of 1907, and we do not think parliament remains a viable arena for communist activity, but the central lesson is clear. The response to war is revolution not class collaboration. Thank you stevein7 for your response, but unfortunately, when war has already broken out and workers are being invaded, it is only workers remaining alive who will be able to try to engage in revolution or class collaboration. Don't forget what eventually happened to Rosa Luxemburg and Karl L, and to Roza Robota and her comrades. Such disasters daunt us beyond burning books. Every capitalist regime is a ruling class dictatorship. Workers are already "invaded" in every circumstance under capitalism. Their role is to be exploited. Marx made this explicit. Nothing to lose. As you say, workers left alive can choose between class collaboration and revolution. The revolutionary organisation will never advocate the former, or like the Second International, it will become a corpse. Responding to stevein7's comment of 11-24-10:29, your second sentence spins the word 'invaded' way beyond its normal military meaning, and it won't do just to claim that capitalist control of lands is the same as having literally been invaded. Workers throughout much of Europe know the difference, whereas in Britain it is a while since Romans, Saxons, and Vikings arrived, followed by failed attempts by William the Conqueror and Adolf to rule the roost here. William the Conqueror failed to conquer. Revisionist history indeed unless you are a little Englander. Thank you, Cleishbotham, for pointing out my stupid error re William the Conqueror. I should have known better, after years at schools and knowledge of the Bayeux Tapestry and so on. A study of stonemasonry had some relevance for me, too, and experience of using a mallet and chisels gave me a more vivid experience, as do glances at stone-built buildings. However, my haste in trying to summarise names of those not succeeding in invading, despite if allowing for my error, might still be worth considering. For instance, to imagine the after-effects if 'Hitler' had succeeded in fully occupying the USSR, if 'nationalists' hadn't resisted, does bear thinking about. Of course it can be said that much or most of the world is under capitalist 'occupation', but resistance to that seems to be more selective as regards timing than do those to threats of the immediate wars that capitalism unleashes, when questions face workers as to assessing prospects of circumstances favouring success of revolutionary as compared to military struggles, when there is any difference between them. But then I recently read:- 'Communists have a fundamentally different starting point: we do not ask whether the existence of one group of workers is good or bad for another group of workers, but how we can defend the interests of the working class as a whole.' But then I say that we come back to all those directly or indirectly concerned in and/or undergoing what takes place, losers and winners. Thanks a lot for publishing it! Thanks comrades for the explanation! It makes it an even better image (and I don't know an English equivalent so I think our comrade would have struggled to find a single word like that). KLZ Your history of the Second World War is also faulty. Whilst the Stalinist regime appealed for support for "Mother Russia" and the Nazis of course made Germans the ubermensch Hitler also made full use of nationalism inside the USSR to get the support of Ukrainian nationalists (before ratting on them) and for a time the OUN (Organisation of Ukrainian nationalists) collaborated with the hunting down of Jews. 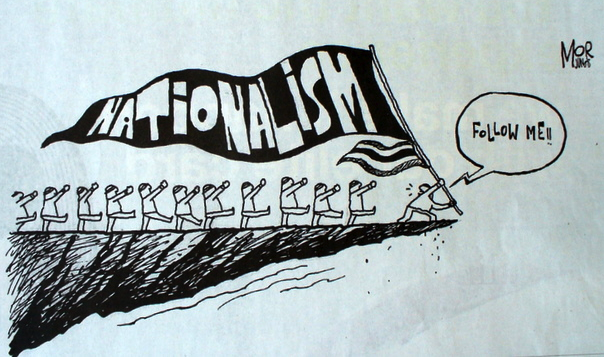 The point here is that nationalism is at the beck and call of the major imperialist powers who use their own nationalism at home and play proxy wars with nationalist movements abroad - all this is the enemy of working class emancipation. Actually I have been well aware, for many years, of the collaboration of numbers of Ukrainians with the nazis, of their providing the nazis with guards in death camps and during and since the formation of the current Kiev regime, which is bolstered by the support of neo-nazis. On your closing remarks, whilst imperialism cons millions into wars, is there never ever a case for participation in some of them, in that, on balance, the outcome can perhaps be shown to be more favourable to the working class than would be that of not doing so ? It has been said, if I remember correctly, words to the effect that ICT is not pacifist. The real racket is that masses of profits are made from the manufacture and selling of weaponry, aircraft and vehicles, to and for whichever government wants and/or is already operating in war, blatantly advertised by jingoist propaganda. hahaha! Yes we imagine, and sorry us. We have this horrible tendence to use words of the countryside and proverbs that are really difficult to translate! !